There is never a shortage of reasons to visit Verín, one of the most “carnivalesque” towns in Galicia. Travellers can walk through its urban centre to see the small squares, the Mercedarios convent or the old Acevedos house, making a stop from time to time to drink some wine of the Monterrey Designation of Origin and a tapa. They must, of course, climb up to the spectacular Monterrei castle, in the neighbouring municipality of the same name but very close to the city centre, a fantastically preserved palace that finds its roots in the twelfth century. And they can also take advantage of tourist initiatives as interesting as the river Támega’s cycling eco-road or, of course, the town’s proximity to Portugal and the beautiful city of Chaves. But it is mandatory for those who visit Verín to see the imprint left by thermal baths in the town. And there is no better way to do so than walking calmly through the park that surrounds the Cabreiroá spring. The mere mention of this name situates almost anyone: Cabreiroá is a very well-known brand throughout Spain for its bottled water, and the spring from which they come is just a few minutes’ walk from the centre of Verín. The route is also very pleasant, since the spring is located in the middle of a very large park populated by old trees of several native species. And now, a bit of history. The Cabreiroá spring became known outside of Verín, along with many other medicinal sources, at the time of splendour of the thermal baths: the final stretch of the nineteenth century. At that time, travelling to “take the waters” was an activity fit for distinguished people, and many came to Verín to treat various illnesses. 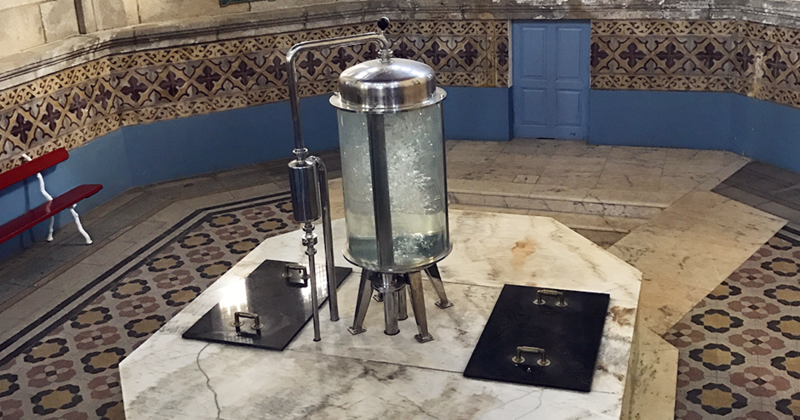 The validation for Cabreiroá’s popularity would arrive at the beginning of the twentieth century, when Dr. Santiago Ramón y Cajal analysed the water and certified its medicinal value. It was the year 1906, the same year in which the doctor was awarded the Nobel Prize. The first third of the twentieth century was a very busy time. The main building is from that era: it is a delightful construction with traces of art deco style, octagonal in shape, at the centre of which is the main spring that emerges from a beautiful glass capsule under which the water bubbles before reaching the surface. This kiosk was the central part of a complex in which a spa hotel and a water-bottling factory, still in use, were also erected. The spa suffered during the Civil War: it was turned into a hospital and barracks, and it did not recover its strength until the sixties. At present, water-bottling is still the most important activity. Cabreiroá has already accumulated over century of history and is still in very good health. The same can be said for another famous spring in Verín, Aguas de Sousas. Located just a kilometre and a half to the south, it is one of the oldest springs in Galicia. Even now you can visit the old kiosk that shelters the fountain, just across from the bottling factory of another water spring that takes Verín’s name all through the world.